Em Stafrace| Just a Girl with Ideas: New DECADE and lots of good times ahead! New DECADE and lots of good times ahead! HAPPY NEW YEAR EVERYONE! Wow its a new decade, and if there are any spelling mistakes please forgive me, already onto my 2nd Corona and listening to some Jet, Muse and heaps of Powderfinger...wooohooo! We had a really quiet night last night sitting on the couch playing some cards, talking and eating our fave feast we call 'THE DELI MUSTER'- one big platter full of all those divine yummies you can pick up from the deli preferably a good European one and then you just simply eat to your hearts content. We popped down to our local deli & purchased a rip rorter sorry for the pun but bejeezes they are potent and scrummy have a looksie at this little ripper of a product made here in Oz! 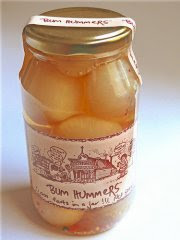 Bum Hummer's 1000 farts in a Jar! Okay so now onto being a little less disgust-a-mondo and talk more about what this year will hopefully bring for Dan and I. I really hope reading back on this post will prove to me that what you really want can happen.First and foremost our biggest aspiration, hope and dream is to become parents....please, please, please be the year that we become 3!!!!! Nearing 40 really makes me squirm, not so much about the age because there ain't anything I can do about that but that maybe I have missed the boat on this one! Still we will get there no matter how much we have to go through to be Ma and Pa! Scrapboutique business...The first of January is the first day of our 2010 challenges to be set. I was scheduled for the Monthly Themed Challenge and this month I thought given its the start of a new DECADE how about we style a LO around the decade from which we were born in!!! 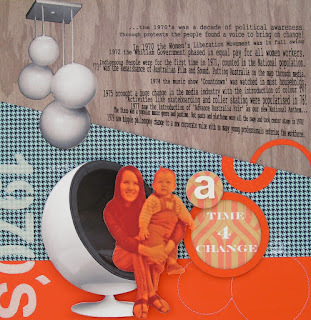 Here's my LO all about the 1970's! I had a lot of fun with this one, pinching some furniture icons of that era and some key points of what happened socially and politically...what a decade of 'CHANGE' and talk about groovy baby! Teresa Collins: Friendship 'Taylors Flowers' B Side, American Crafts: 'Blue Skies Wouldn't it be Nice' PP, DCWC: Nature Background PP, Making Memories Paint, chipboard & American Crafts Thickers 'Subway' Alpha.